It’s time to deck the halls with boughs of holly and get a warm bubble bath ready to go—Lush has unveiled its giant holiday collection, and it’s a dream. Read more: QUIZ: What scene Christmas song are you? There are so many products, from limited-edition goodies to classic favorites, but across the board, the products are festive, fun and give us all the holiday warm-and-fuzzies. Get those chestnuts ready to roast by an open fire, and grab a cup of cocoa. 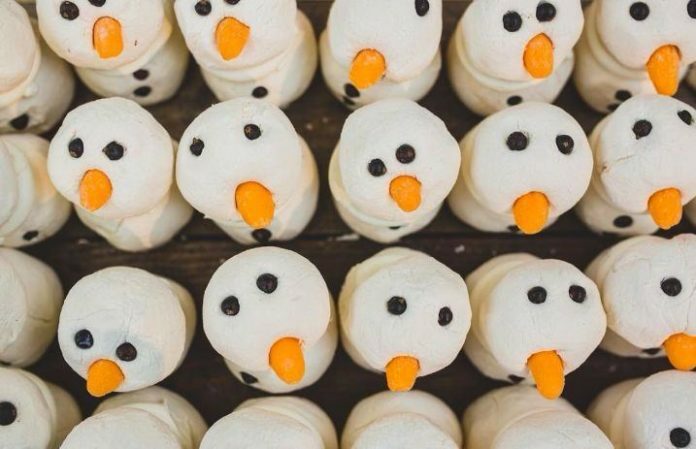 Your bath is about to get extra festive. It’s adorable—AND packed with fair trade cocoa and shea butters! It’s full of murumuru butter, which will leave your skin feeling silky soft. Smell like candy this Christmas. Snow Fairy Shower Gel has a new naked (packaging-free) buddy that's eco-friendly! It smells JUST like candy. It’s packed with festive cranberry infusion and antioxidant-rich blueberry juice. Made with invigorating peppermint and menthol crystals, it energizes and fills you with all the holiday excitement. This jelly is infused with fresh apple and grape juices and blended into the soft seaweed base. Luxury Lush Pud is a returning favorite! This colorful ballistic shares Sleepy Lotion's lavender scent, so it's perfect for just before bedtime. This bath bomb is built for Christmas Eve, with islands of sleepy foam and comforting lavender. If you run it under water, candy-scented bubbles magically appear. Incredible. It’s full of cocoa butter—and utterly adorable. And if you want a peek at the hundreds of beautiful holiday beauty products, you can do so here! What will you be picking up to celebrate the holidays right? Let us know in the comments below!